The Justice Department has filed a lawsuit to block AT&T's takeover of Time Warner, the parent company of CNN. The lawsuit, filed in federal court in Washington, D.C., on Monday, is an unusual challenge to the $85 billion deal, which was announced by the two companies more than a year ago. AT&T says it will fight the case in court. In the suit, the DOJ argues that the deal violates antitrust law because AT&T would likely "use its control of Time Warner's popular programming as a weapon to harm competition." The government alleges that the deal "would result in fewer innovative offerings and higher bills for American families." AT&T has been preparing for a potential legal challenge. It immediately disputed the government's claims on Monday. David McAtee II, AT&T's general counsel, said in a statement: "Today's DOJ lawsuit is a radical and inexplicable departure from decades of antitrust precedent. Vertical mergers like this one are routinely approved because they benefit consumers without removing any competitor from the market. We see no legitimate reason for our merger to be treated differently." In a press conference Monday, AT&T CEO Randall Stephenson sharply criticized the DOJ's decision. "I've done a lot of deals in my career, but I've never done one where we have disagreed with the Department of Justice so much on even the most basic of facts," Stephenson said. "The rule of law is at issue here," he added later. Stephenson also addressed the speculation that the Trump administration's opposition to the deal stems from President Trump's feelings about what he believes is CNN's unfair coverage of him. "There's been a lot of reporting and speculation whether this is all about CNN, and frankly I don't know. But nobody should be surprised that the question keeps coming up because we've been witnessing such an abrupt change in the application of antitrust law here," Stephenson said. Stephenson did say that AT&T and Time Warner will continue to try to negotiate with the Justice Department and to offer concessions that could allow the deal to close. But, he said, "Any agreement that results in us forfeiting control of CNN... is a non-starter." He also suggested that the DOJ's action will create a climate of uncertainty in the business community, because companies will be unsure how or whether they can proceed on certain deals. If AT&T (T) prevails in court, it will be able to go ahead with the acquisition. Some experts believe the case could be resolved in a matter of months. But a lengthy, drawn-out court battle could cause AT&T and Time Warner (TWX) to give up on the deal. When the government reviews megamergers, it seeks to determine whether the transaction will cause harm to customers. In most cases, government lawyers negotiate with the companies to reach an agreement that staves off a lawsuit. That's what AT&T and Time Warner anticipated -- that the DOJ would apply conditions to the deal, much as the Obama-era DOJ did when Comcast acquired NBCUniversal. One potential condition would ensure that AT&T played fair with its rivals while negotiating for other cable and satellite providers to carry channels like CNN and TNT. The deal was announced in October 2016. But Trump's election a few weeks later was a curveball. While Republican administrations have historically been business-friendly, Trump vowed to block the deal while campaigning, and vociferously criticized CNN after taking office. Trump fired off more shots at the network the week before the lawsuit was filed. He tweeted one morning last week: "While in the Philippines I was forced to watch @CNN, which I have not done in months, and again realized how bad, and FAKE, it is. Loser!" His tweets could potentially now be cited by AT&T as circumstantial evidence of presidential interference. Amid all the "fake news" tweets, DOJ staffers began reviewing the deal earlier this year. There was rampant speculation that Trump might try to hold up the deal to punish CNN for what he saw as unfair reporting. But there was little concrete evidence to back up this theory. After a lengthy delay, the president's pick to run the DOJ's antitrust division, Makan Delrahim, took charge in September. When the deal was first announced, Delrahim had said he saw no major antitrust issues with it, but he has apparently since changed his mind. Delrahim is a proponent of structural remedies to protect consumers, rather than requiring so-called behavioral conditions like the ones used in the Comcast-NBCUniversal deal, on which Delrahim had worked as a lobbyist for Comcast. In the case of AT&T, a structural remedy could be a sale of Time Warner's Turner division of cable channels, including CNN, or the sale of its DirecTV arm. The government's likely rationale? 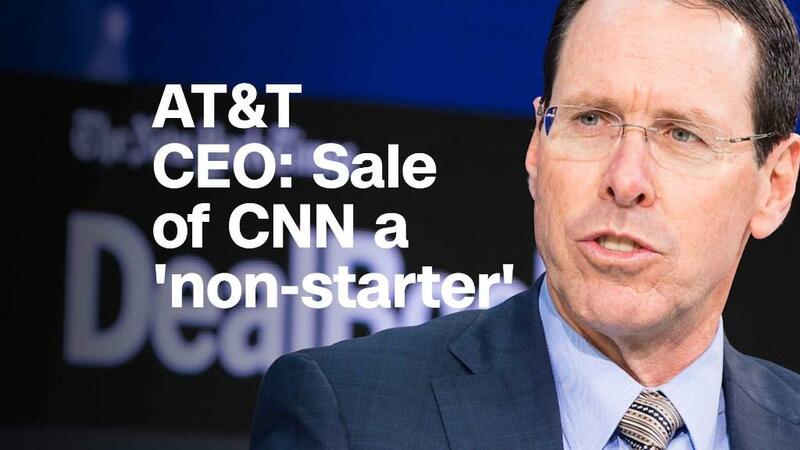 Owning a bundle of channels and a big distributor of channels would give AT&T an unfair advantage in the marketplace. Liberal advocacy groups and some of AT&T's competitors agree -- and that's one of the reasons why they lodged complaints about the deal. But they never expected a GOP-led Justice Department to side with them. They thought the deal was a layup for AT&T. So now there are two competing narratives about what's going on. The first point of view is that the Justice Department is intervening to protect consumers. The countervailing point of view is that political games are being played. Lawyers in the DOJ are typically insulated from political pressure, but the Trump administration is atypical. Trump has been critical of the DOJ and Attorney General Jeff Sessions all year long. He has recently urged the department to investigate his political rivals, including Hillary Clinton. Several prominent Democratic lawmakers have questioned whether Trump's hatred of critical news coverage has trickled down into departmental decision-making. AT&T may raise similar questions during the looming court fight, according to a recent report by Bloomberg. "In the event of a trial over the $85.4 billion deal, AT&T intends to seek court permission for access to communications between the White House and the Justice Department about the takeover," Bloomberg reported. Delrahim has denied being influenced by Trump. At a House hearing last Tuesday, Sessions was asked if any White House official has contacted the DOJ regarding the AT&T deal. Sessions demurred. "I am not able to comment on conversations or communications the Department of Justice top people have with top people at the White House," he said. All of this uncertainty has caused some press advocacy groups to ring alarm bells about the appearance of political pressure. "The president's behavior has cast a cloud of doubt over the work of these honorable civil servants," the Washington Post editorial board wrote last Monday. The editorial urged the Senate subcommittee on antitrust, competition policy and consumer rights to "exercise its oversight responsibility and convene a hearing on the matter." This situation is also unusual because it spilled into public view. Earlier this month there were news reports about the prospect of a DOJ lawsuit. Then there were leaks about a private meeting between Delrahim and Stephenson. At a November 6 meeting, the two men discussed divestitures that might satisfy the government's concerns. By all accounts, the meeting did not go well. Some sources said Stephenson floated the possibility of selling CNN or other assets. Other sources said the DOJ demanded more -- just not the spinoff of CNN, but the sale of the entire Turner division, or DirecTV. AT&T viewed these demands as nonstarters and began to see a courtroom battle as a more serious possibility. Speaking at the Dealbook conference a few days after the meeting, Stephenson disputed claims that he offered to sell CNN to win government approval of the deal. Stephenson said at the time that AT&T was continuing to talk with the DOJ "to see if we can get to a negotiated settlement." But as the days dragged on, that looked less and less likely. The big question now, as BTIG Research analyst Rich Greenfield said in a note to investors, is "whether the DOJ's case is strong enough to win in court."